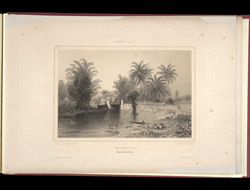 Lithograph of the Ferry Inn from Adolphe Duperly's 'Daguerian Excursions in Jamaica.' The Ferry Inn was built in 1684 on the main road between Kingston and Spanish Town. The area was once a swamp and in 1677 William Parker gave permission for a ferry to be launched to carry passengers across it. He built a tavern near the crossing point which provided a welcome relief for travellers. It became a fashionable venue for Jamaican society.